Here’s a quick, easy way to repair minor damage to plaster and gypsum board surfaces. Maybe there was a mishap while moving a major appliance. Or perhaps someone hung some pictures the old-fashioned way by (gasp!) hammering nails rather than relying on damage-free wall mounting strips. Whatever the cause, you’re now facing small dings, dents, and gouges to your plaster or gypsum board walls. The fastest fix is to use spackle compound—a type of putty not to be confused with drywall or joint compound, which are applied similarly but generally used to remedy larger, properly reinforced holes. What’s great about spackle compound is it dries quickly and shrinks minimally, allowing you to patch minor damage without waiting 24 hours before repainting. Nail down precisely how to spackle, and you’ll make short work of all future wall repair. 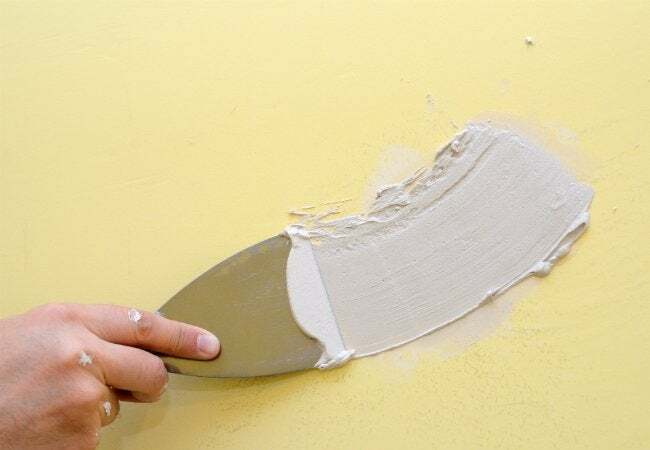 To repair a small hole, opt for pre-mixed spackle. Larger holes? Use a product that includes acrylic. Ready the repair area both by cleaning it and by removing any loose debris around the perimeter. With a putty knife, use slightly angled, downward strokes to apply spackle to the hole. Scrape away any excess product, once you have finished fully covering the repair area with spackle. Let the compound dry, then assess your work, applying another course of spackle if necessary. Sand the repair with fine-grit sandpaper and clear away any dust with a cloth or sponge. First, pick your compound. Spackle compound comes two ways: in a convenient pre-mixed paste or in powdered form that you’ll mix with water for proper consistency. Pre-mixed compound is sold in “lightweight” and “all purpose” varieties. The former, which includes a vinyl binding agent, is best for small holes in areas that aren’t vulnerable to future damage; the latter includes acrylic and is suitable for voids as wide as 3/4 inch. Both vinyl and acrylic add elasticity to minimize shrinkage. Prepare the area you plan to spackle to enhance the putty’s sticking power. Use the putty knife or fine-grit sandpaper to clean all debris from in and around the hole and make the surface as smooth as possible. 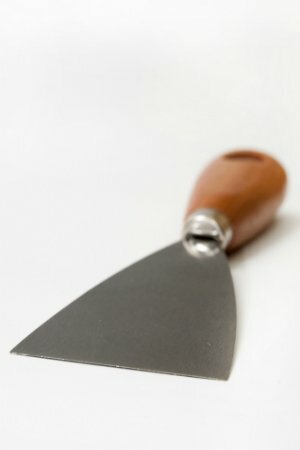 Dip the edge of the putty knife into the spackling compound and scoop out a bit more than what you’ll need to fill the hole. Hold the putty-loaded knife slightly above the damage site at a slight angle and apply with a downward motion to patch. When the hole is filled, hold the knife at a 90-degree angle to scrape away excess, taking care not to pull the putty from the hole. Don’t strive for perfection here as you spackle the wall; you’ll sand it smooth once dry. Use a damp cloth or sponge to wipe residual compound from the wall next to the repair site. Review your work after about two hours, when the compound should be dry. If the patch seems to be recessed, the paste shrank a bit as it dried. (Holes deeper than ¼ inch often need more than one application.) Repeat the previous steps, this time leaving a slight mound that you’ll sand off later. Wait another two hours. Once your spackle compound is dry, lightly sand the repaired area with fine-grit sandpaper until it’s flush with the surrounding wall. Use the cloth to wipe away any dust. Now that you’ve mastered how to spackle this gouge and nearly any other dings to come, simply prime and paint the patched area until it fully blends in with the surrounding wall. A seamless look, in a snap!